I’m a self-confessed mobile phone dinosaur but smart phones are beginning to convert me – dangerous stuff! Francine has one and it is undeniably useful for some things, given the right “app” of course. [:)] In this case the right app was the Met Office enabling one to look up photographically important information like sunrise and sunset, as well as a guess, usually bad, at the weather. We were on site ~5:20 AM to get ready for sunrise at 6:40 AM. There is a lot of wandering about to be done considering different views before settling on a tripod location. I remained in the car for some warmth before joining Francine as dawn approached. To both our minds, I think, the light before dawn was more appealing than the light once the sun had risen. Playing with a “CA” setting on my camera, which I really must look up, I snagged a picture of Francine taking her picture. Here are both making for an interesting comparison, I think. I’d say the expensive filters are worth it. 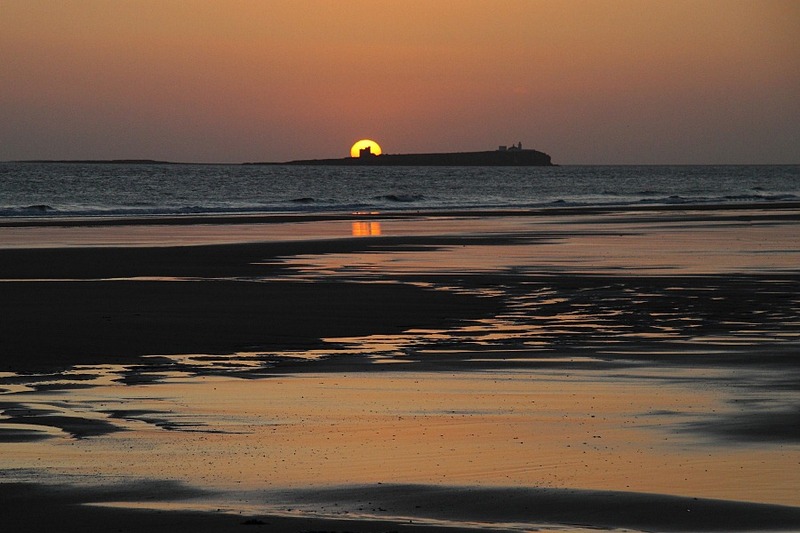 The celestial artistic director had creatively arranged for the sun to rise directly behind the innermost of the Farne Islands. This looked like a chance not to be missed but, with no tripod, it had to be a hand-held shot. Thank technology for image stabilized lenses. I had to clone out an irritatingly placed man and his hyperactive dog, both of which were positioned between me and the surf. We’re clearly not the only maniacs out and about pre-dawn. 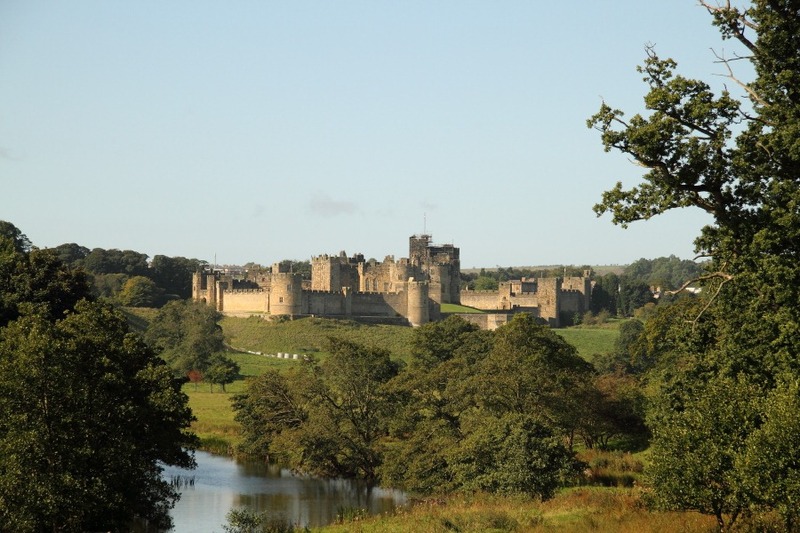 After a well deserved hearty breakfast, we shot off to Alnwick to check out its castle and market. The castle had the ubiquitous scaffolding, so beloved of historic buildings, but in a distant shot wasn’t too offensive. The market was a little dull but there was an excellent cheese shop where we finally managed to purchase one of the Doddington Dairy “artisan” cheeses: Berwick Edge, “a strong and fruity Gouda-style cheese”, and very good it was, too. In chatting to the cheese shop proprietor, we learned that the Doddington Dairy had had a bad time with a foot and mouth disease outbreak and now kept everyone off the farm, including the postman. Had we actually found the farm, there is apparently an honesty box outside to make purchases. 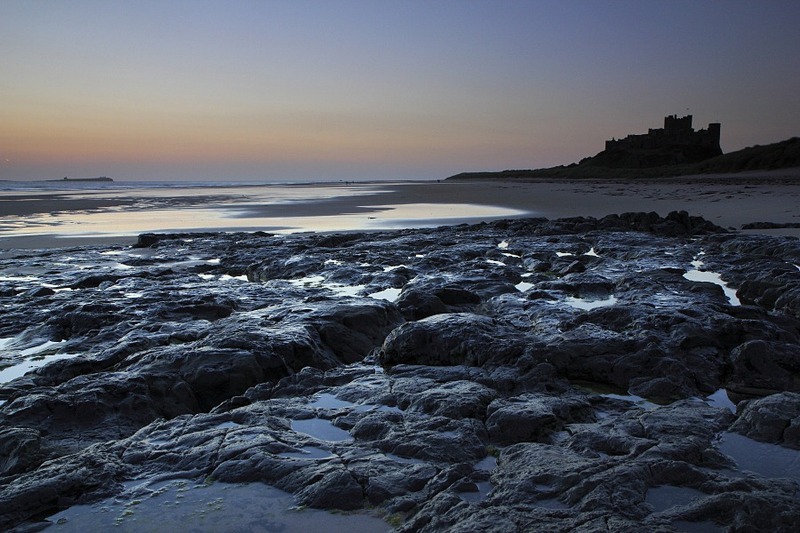 The sun continued to shine and we continued to Craster, famous for kippers, though Seahouses claims to be the original birthplace of the kipper. More appealing for lunch, however, was one of the crab sandwiches being offered by the Jolly Fisherman pub overlooking the coast sounded even better, especially as I could wash it down with the finest pint of Timothy Taylor’s Landlord bitter I’ve tasted. Everyone visiting the bar was ordering crab sandwiches with their drinks; they were doing a roaring trade. 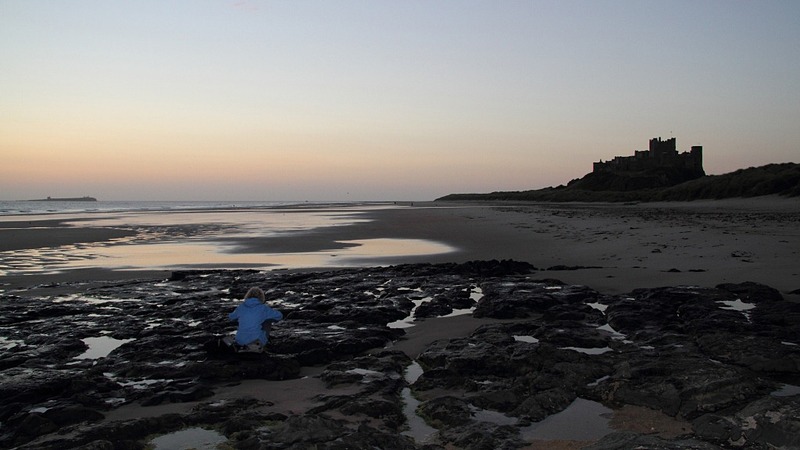 Thus fortified, we wandered the 1¼ mile coastal path northwards to Dunstanburgh Castle, considerably more of a fixer-upper than the other two castles we’d seen earlier in the day but definitely in an imposing location. Francine took the low road by the water’s edge whilst I took the high road by the sheep; here’s a shot from the high road. Eventually some hazy, high-level cloud reclaimed the sky and we returned to Guillaume after the best day of our trip, though it has to be said that there’s been little in the way of competition for it. 1 Pings/Trackbacks for "A Prial of Castles"